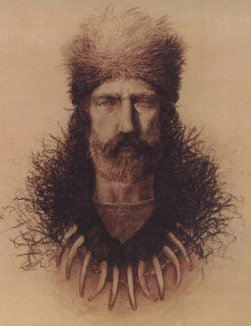 In August 1823, old frontiersman Hugh Glass was scouting ahead for a fur trapping expedition in South Dakota when he surprised a grizzly bear mother with her two cubs. The bear charged him immediately, knocking his rifle away and mauling him badly. Glass drew his knife and fought the grizzly hand-to-hand (maybe I should say hand to paw? ), stabbing it repeatedly as it clawed and bit him. Hearing his screams, two trapping partners soon arrived and found him laying unconscious on top of the bear in a ghastly mess of human and animal blood. They finished off the dying bear with a rifle shot to the head, then took Glass with them back to their camp. Expedition leader Andrew Henry took a good look at the mangled mess of a man and announced that he would soon die of his injuries. Henry asked two trappers to stay with Glass until he died, give him a good burial, and then rejoin the group. Jim Bridger and John Fitzgerald volunteered to stay behind with Glass and began to dig his grave. What happened next is uncertain. The two men later claimed that they fled for their lives after hostile Arikaree Indians discovered them, but there is no evidence of that. They soon caught up to the rest of the group heading to Yellowstone and reported that Hugh Glass was dead. However, the old mountain man did not die—after an unknown period of time he woke up in his shallow grave, under a thin layer of dirt and leaves. All his weapons, equipment, and protective clothing were gone, taken by the two men responsible for his burial. His leg was broken, and the rest of him was hardly better off. The bear attack had cut him so badly it exposed rib bones on his backside. He had lost a lot of blood, and his wounds were festering. Alone and defenseless, he was more than 200 miles away from the nearest settlement, Fort Kiowa. He set his own broken leg, wrapped himself in the bear hide that had covered him in the grave, and started crawling. It took Glass six weeks of crawling on his hands and knees to reach the Cheyenne River, 100 miles away from his grave. The bear had nearly torn off his scalp. He suffered from fever and advanced stages of infection. To prevent gangrene from progressing in his wounds he lay back on rotting logs and let the maggots eat his dead flesh away. Too weak to hunt or fish, he survived mostly on wild berries, roots, and other edible plants. Once he was able to scare a couple of wolves away from a bison they had killed. He ate some of the bison’s raw meat himself, still alone, dragging his broken leg along with him. When he finally reached the Cheyenne river, he built a raft from a large fallen tree and floated down the river. Along the way he encountered friendly Sioux who fed him and helped tend his wounds. Eventually he succeeded in floating in his dead tree all the way to Fort Kiowa. His story doesn’t quite end there.